Take off on an amazing adventure illuminating Chinese history, culture, & modern society. Discover Beijing & Shanghai’s ancient & contemporary jewels with visits to the magnificent Great Wall of China, the Forbidden City, the Oriental Pearl Tower, & more. Enjoy traditional Chinese cuisine, & see the spectacular acrobatics show. Great Wall of China – Visit the Mutianyu section of the Great Wall, which dates back to the 6th century. Enjoy amazing scenic views, a cable car ride up the mountain, & a thrilling ride down on the toboggan sled. Ming Tombs – Imperial burial complex of thirteen Ming Dynasty emperors, which features the Dingling Underground Palace. The Forbidden City – Ancient palace complex of Ming & Qing Dynasty emperors, dating back to the 15th century. 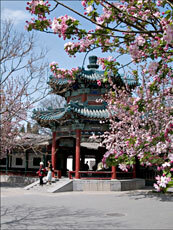 Features close to 1,000 buildings, including the Palace Museum. Jade Buddha Temple – Presently active monastery, dating back to the late 19th century. Features two famous jade statues of Buddha & invites guests to discover Chinese history & modern culture. Shanghai Museum – Located at the People’s Square. Features ancient Chinese ceramics, jade, sculptures, furniture, & more. 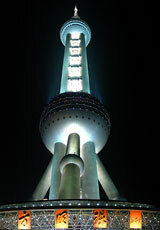 Chinese Acrobatics Performance – See one of the most incredible acrobatic performances live in Shanghai. Arrive in Beijing. Transfer to hotel, & enjoy the remainder of the day at leisure. 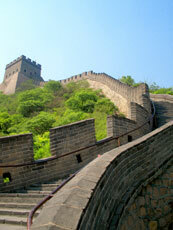 Visit one of the greatest famed structures in the world, The Great Wall of China. Enjoy a cable car ride up to the Mutianyu section of the wall & discover the amazing scenery of the surrounding mountains. Afterward, experience a thrilling return to the valley on the toboggan sled. This afternoon, walk down the Sacred Way, “the path that leads to heaven,” which features impressive stone statues of animals & mythical creatures, & enter the Ming Tombs complex, the final resting place for thirteen Ming Dynasty emperors. Highlights of the complex include the Dingling Underground Palace & the Great Red Gate, China’s largest stone archway, dating back to the 16th century. Explore Tian’anmen Square, one of the world’s largest public squares, located in the center of Beijing, & enter the Forbidden City, an ancient palace of Ming & Qing Dynasty emperors. Dating back to the 15th century, the imperial complex features close to 1,000 buildings, including the Palace Museum. 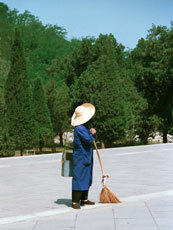 Next, visit the Temple of Heaven, & learn about the ceremonial traditions of the two dynasties. This evening, enjoy one of Beijing’s most popular dishes at a local restaurant, the roast duck. 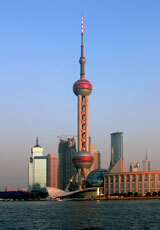 Travel to the city of Shanghai, situated next to Asia’s longest river, the Yangtze. Enjoy the afternoon at leisure. Relax, visit one of the city’s unique tea houses, or browse the latest fashions on a stroll down Nanjing Road. This morning, visit the Jade Buddha Temple. This presently active monastery, which dates back to the late 19th century, features two famous jade statues of Buddha & invites guests to discover Chinese history & modern culture. Before lunch, enjoy time to explore the local shops of Tianzifang, located in Shanghai’s charming French Concession area. This afternoon, enjoy a sight-seeing tour of the city. Modern architectural highlights include the Jinmao Tower & the Oriental Pearl Tower, standing at an amazing 468 meters high. Discover the peaceful Yuyuan Garden, a classical Chinese garden famous for its exquisite jade rock. Tour the Shanghai Museum, which features ancient Chinese ceramics, jade, sculptures, furniture, & more. Capture the essence of Shanghai’s history & culture on a walk down the Bund, located alongside the Huangpu River. This row of banks features a mile-long display of historic buildings, numerous styles of architecture, & amazing views of the city. Tonight, enjoy a Chinese acrobatics performance. Day 7: Shanghai – U.S.